Here is a great idea for HIPPA compliance with off site backups. This portable USB hard drive features a keypad that requires the correct pass code to access the 128 bit encrypted data. This line of secure drives is slated to be called "ThinkPad USB Portable Secure Hard Drive". The drive will allow pass codes for 1 administrator and 10 users to access the drive. It comes with a built-in USB cable and 2 sizes are available: 160GB for $179 and 320GB for $219. Availablilty will be mid-November (meaning any day now). RESEARCH TRIANGLE PARK, NC – November 13, 2008: Lenovo today announced the ThinkPad USB Portable Secure Hard Drive to give customers a secure way to protect sensitive data in a lightweight and easy-to-use design. The award winning, high capacity hard drive, available in either 160 or 320 GB versions, uses a numeric keypad allowing users to type in their passcode to access their data. At less than an inch thin, and approximately the size of a 3 x 5 inch index card, it’s small enough to fit in a shirt pocket. The new secure hard drive meets the 128-bit advanced encryption security standard to help ensure information remains secure, and real-time encryption means users don’t have to wait for the “lag time” that typically accompanies encrypted drives. 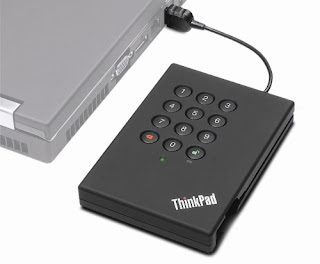 The hard drive features full-disk encryption for up to ten unique user ID’s and one administrator, making it an ideal tool for ThinkPad notebook PC users on-the-go or collaborating at work. Additionally, the self-powered hard drive eliminates the hassle of keeping up with power cords, and a convenient built-in USB cable makes transferring data simple and stores in the hard drive’s housing when not in use. Recognized for its combination of simple-to-use design and advanced levels of security, the Consumer Electronics Association recently awarded the ThinkPad USB Portable Secure Hard Drive the CES Innovations 2009 Design and Engineering Best of Innovations Award in the Computer Peripherals category. The prestigious Innovations Design and Engineering Awards recognize achievements in product design and engineering and are sponsored by the Consumer Electronics Association. Innovations entries are judged based on engineering qualities, aesthetic and design qualities, function and user value and unique features. In addition to the new hard drive, the CEA recognized Lenovo as an Honoree in the Computer Peripherals category for its space-saving and eco-friendly design of the ThinkCentre M57p Eco ultra small form factor desktop. With the desktop’s vertical stand, users can attach the desktop behind their ThinkVision monitor, saving previous desktop real estate and showing off a clean design. The peripherals will be displayed at the 2009 International CES, which runs January 8-11, 2009, in Las Vegas, Nevada. The Innovations Design and Engineering Showcase will feature honorees by product category at the Sands Expo and Convention Center/The Venetian, Booth #72062. Best of Innovations honoree products will also be displayed at the Grand Lobby of the Las Vegas Convention Center, next to Experience CEA and at CES Unveiled: The Official Press Event of the International CES on Tuesday, January 6. The ThinkPad USB Portable Secure Hard Drive will be available starting in mid-November at $179 for the 160 GB model and $219 for the 320 GB model1. It will be available through Lenovo business partners and www.lenovo.com.